The FDA recently announced approval of the medication (brexpiprazole or Rexulti) both for the treatment of schizophrenia and as an adjunct to antidepressants in the treatment of major depression. The simultaneous approval of the medication for both indications is quite unusual. Brexpiprazole has a complicated pharmacology. 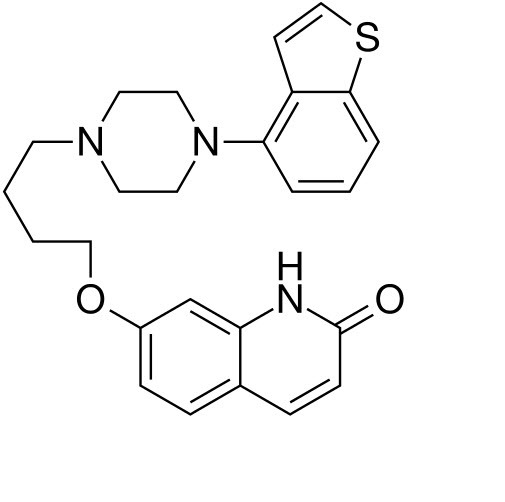 Similar to aripiprazole (Otsuka’s atypical antipsychotic which recently came off patent and which this medication seems designed to replace) it acts as a partial agonist of the 5-HT1A, D2 and D3 receptors. This picture shows have dopamine agonists, partial antagonists and full antagonists stack up. 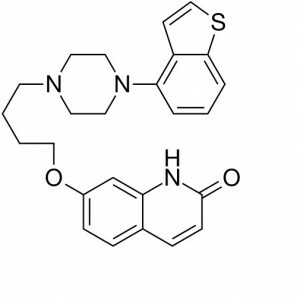 It is also an antagonist of the 5-HT2A, 5-HT2B, 5-HT7, α1A-, α1B-, α1D-, and α2C-adrenergic, and H1 receptors. 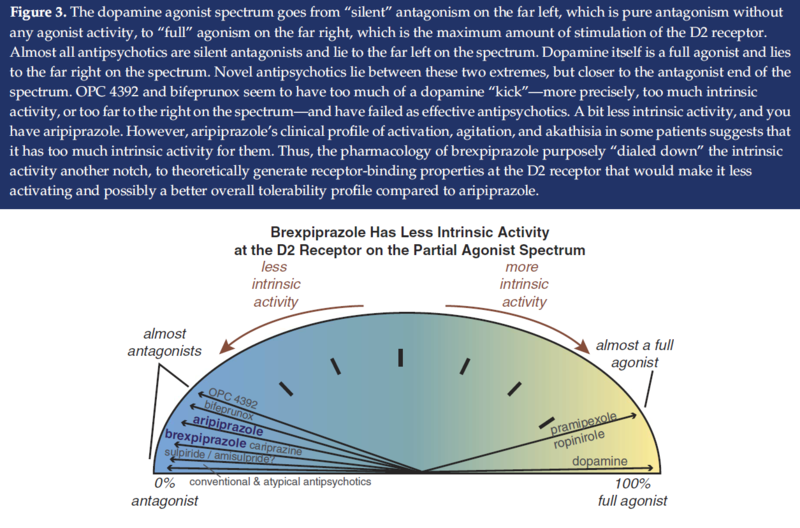 It’s antagonist activity at the 5-HT7 receptor makes it similar to lurasidone, which was also introduced with an unusual set of indications: for bipolar depression and for schizophrenia. Its H1 antagonism means that it may be somewhat sedating. It has negligible affinity for the mACh receptors in the should not be associated with dry mouth, constipation and other adverse effects of anticholinergic medications. The Phase II multicenter, double-blind, placebo-controlled study randomized 429 adult MDD patients who had not had an adequate response to one to three antidepressant medications used during the current episode of depression. The antidepressants studied included desvenlafaxine, escitalopram, fluoxetine, paroxetine, sertraline, and venlafaxine. The primary outcome measure was was the change in MADRS (Montgomery-Åsberg Depression Rating Scale). Antidepressant plus 2 or 3 mg of brexpiprazole was superior to placebo. In the trial, the combination resulted in a roughly 8 point drop in MADRS score (average pre-treatment was 27) this corresponded to reductions of 8.36 (2 mg) and 8.29 (3 mg). Placebo plus antidepressant was associated with reductions of 5 to 6 points. The 1 mg dose was not effective. Discontinuation due to adverse reactions was 3% for antidepressant plus brexpiprazole compared with 1% for placebo. The most common adverse reactions for brexpiprazole included akathisia (9% vs. 2% for placebo), and weight increase (7% vs. 2% for placebo). in schizophrenia but less sedation than aripiprazole in major depression. Citrome’s analysis of efficacy using the number needed to treat (NNT) showed that this was similar for both brexpiprazole and aripiprazole.